Just what does good state highway performance look like, according to the climate change skeptics at the Reason Foundation? This “libertarian think tank” — funded by Exxon Mobil and the Koch Family Foundations, among others — has a funny way of judging these things. But media outlets all over the United States are reporting its findings as if they’re gospel. 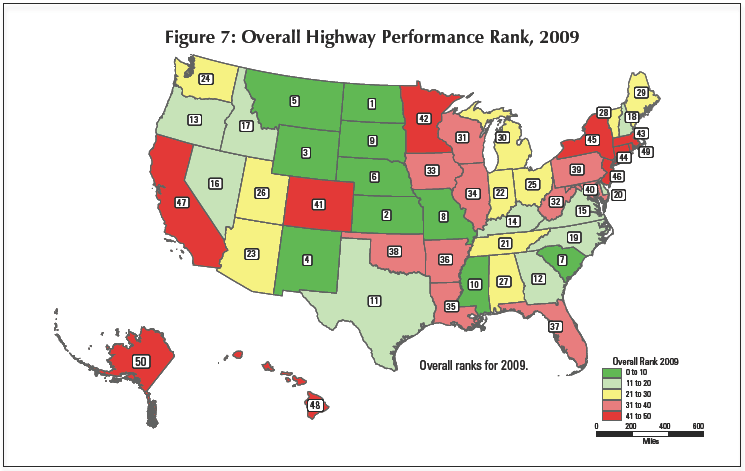 According to Reason’s 20th annual analysis of state highways, largely rural states like North Dakota, Kansas, and Wyoming are performing best, while more urbanized states like New York, Massachusetts, and California are in the bottom tier. What goes into these rankings? We set out to see if the whole thing was worth taking seriously. Reason took 11 indicators into account when judging states’ performance. A few are reasonable enough: percentage of deficient bridges, road conditions in rural and urban areas, how much states spend on administration versus construction. But there are quite a few head scratchers. States are rated by how much they are spending per mile on capital and bridge disbursements. Here rural, southern, lower-cost regions perform better: South Carolina and West Virginia spend the least per mile, receiving the highest rankings. Places with higher costs of living score badly. The “worst performers” in this category are New Jersey, Florida, and California. States are also rated on how much they spend on road and bridge maintenance per mile. North Dakota and South Dakota are awarded the highest rankings for devoting about $5,000 per mile to maintenance in 2009. States that spent the most money on maintenance per mile, New Jersey and California — about $185,000 and $150,000 respectively — came in last. A more fundamental problem is that Reason’s report ignores non-motorized transportation, added Todd Litman of the Victoria Transport Policy Institute. For example, say your state transportation department added a transit-only lane on an urban highway that many people use to commute to work. The road would carry more people, but since the report only measures congestion on highways, and not the more important concept of “accessibility,” your state would still be penalized, Litman said. One, states that are doing a decent job of managing their transportation systems might actually be rated very poorly by this report. Two, media outlets should be much more skeptical about transportation reports from groups that deny climate science. Too bad about the Mercury News, it wasn’t that long ago that it was still a reputable paper. It can be hard to tell the difference between “Reason Foundation” and alt.pave.the.earth sometimes. For a foundation called Reason, they have a pretty poor grasp on logic and working out problems. I find all states do a pretty poor job, however. Unless it’s seizing lanes for bus lanes, nobody should be building more highways. Texas, of all places, seems to have managed most of the rail expansion over the past decade, but its land use policies are every bit as dumb as Florida’s or Virginia’s. New York has managed such anemic transportation improvements that they’re almost comical, for their cost if not their (lack of) utility. California seems to be trying and largely getting nowhere. The closest to good? Maybe New Jersey, at least before Christie came along. On the metric of spending per mile on capital and bridge disbursements, it could be a fair assessment if they actually scaled it to both population growth and average per capita income in the state. Otherwise small regions, particularly those that are already overbuilt, will benefit. Reason’s not known for their concern with fairness or objectivity though, so I doubt they factored those things in. Likewise on the subject of maintenance spending per mile, it should be no surprise that the landlocked plains states came in first. Construction and maintenance on flat ground with very few large bodies of water to traverse is much less difficult and expensive than building and maintaining in hilly, marine areas like Seattle or San Francisco. Also, does the “per mile” cost mean per mile, regardless of width, or is that lane-miles, which it should be? Oh, and this: if it costs you ten times as much to build and maintain a an urban road as a rural one but it gets fifteen times the traffic, that’s still a good deal. Especially if it also provides for opportunities to walk and bike. I also thought it was rather interesting that every single one of the “best” performers in the report had fatality rates worse than the national average, while nine out of ten of the “worst” performers in their report actually had low highway fatality rates. All by the authors’ own numbers and rankings! Lives don’t matter to libertarians, only money. Of course states like Montana and Nebraska spent less per mile than New York or California: Montana and Nebraska need only 2 or 3 two-lane roads to connect their entire population, New York and California need dozens of 12-lane freeways to get their people to sit in traffic!